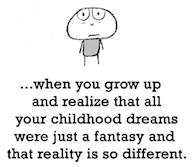 Growing up is an odd process. This has been happening a lot more to me lately as I observe the world around me. It’s not that I notice my own growing process as a functional adult, but as I notice the people around me going through this process. To be honest, I blame all of my younger cousins for this realization. I blame a few of my high school classmates as well. Each birthday that passes for my younger cousins, I’m always floored at how old they now are, whether they’re a year old or sixteen, because I’m just like, “When did this happen?” The same goes for when one of my high school classmates moves on to an important milestone in our adult lives, most of which included them getting married. And once again, someone I know got married this past weekend, but not just anyone though. This girl I literally grew up with and I basically consider her my younger sister. Although I attended the wedding, and filmed it, it still seems very surreal that my “little sister” is now married and about to buy a house with her husband. It’s the events that hit close to home that once again pull me into the realization that I’m an adult. But my brain still refuses to comprehend this entirely. Maybe after I finally graduate college it will? At least I’m not the only one to think this! That’s exactly how I feel about my cousins, but a few are more like siblings so it’s weird when I realize how old they actually are (and that I can have serious conversations with them) I think I’ll feel the same way as you do if I ever have kids (can’t picture it right now).